BACKGROUND AND PURPOSE: In the past, functional MR imaging techniques have been used successfully to determine cerebrovascular reactivity (CVR) to various stimuli, complementing the arsenal of functional brain investigations feasible with MR imaging. While previous studies have focused on blood oxygenation changes under vasodilatory stress, the aim of this study was to assess regional cerebral blood flow (rCBF) changes during breath-holding by using a flow-sensitive alternating inversion recovery (FAIR) imaging technique. METHODS: In six healthy volunteers, FAIR images were acquired during alternating periods of breath-holding and breathing at 40-second intervals after inspiration and at 30-second intervals after expiration, for a total dynamic scanning time of 10 minutes. To quantify the rCBF changes, we obtained 2.5-minute baseline samples during normal breathing. RESULTS: Repeated challenges of breath-holding induced an overall rise in rCBF. In general, rCBF changes were greatest in gray matter and were insignificant in white matter. Using the mean values of the baseline images collected before breath-holding to calculate the rCBF changes, we found that quantitative analysis yielded an rCBF increase of 47% to 87% after breath-holding. The rCBF changes clearly depended on the breath-holding duration and technique; however, for one given breath-holding paradigm the results showed relatively small interindividual variability. CONCLUSION: rCBF changes during a simple vascular challenge can be detected and quantified by means of functional MR imaging at 1.5 T. Noninvasive assessment of CVR could become a useful clinical tool to identify persons with impaired CVR. Functional MR imaging techniques are rapidly moving away from the perceived role of solely mapping human cognitive functions, such as vision, motor skills, or language. These techniques are now capable of detecting and mapping regional hemodynamic responses to various stress tests, which involve the use of vasoactive substances, such as acetazolamide (1, 2) or inhalation of carbon dioxide (3). Besides inhalation of carbon dioxide or injection of acetazolamide, measurement of cerebrovascular reactivity (CVR) can be performed simply and reliably by using a breath-holding test (BHT) (4, 5). This test, which employs the increase of arterial PCO2 induced by breath-holding as a vasodilative stimulus, was introduced in 1990 by Ratnatunga and Adiseshiah (5) and has also been used successfully in functional MR imaging studies (6–8). Most functional MR imaging studies are based on blood oxygenation level–dependent (BOLD) contrast (9–11), using deoxyhemoglobin as nature's own intravascular contrast agent. Although this functional MR imaging technique is most commonly used because of its high functional contrast-to-noise ratio, quantitative interpretation of the activation-induced signal changes is a difficult matter. Because BOLD effects are related to multiple physiologic parameters, such as cerebral blood flow (CBF), cerebral blood volume (CBV), and cerebral metabolic rate of oxygen (CMRO2), it is difficult to extract a single physiologic parameter from the observed signal changes. This problem can be partially overcome by using arterial spin-tagging techniques, which rely on magnetically tagged endogenous water as a tracer and are essentially CBF-based. A number of approaches based on this idea have been proposed, such as signal targeting with alternating radio frequency (12) and flow-sensitive alternating inversion recovery (FAIR) techniques (13–15). These are based on perturbing the magnetization of in-flowing arterial blood and acquiring pairs of flow-sensitive and flow-insensitive images. The CBF-based image is then obtained by subtracting the flow-insensitive images from the flow-sensitive images. Using the FAIR technique, Kim et al (15) were able to determine absolute CBF at steady-state conditions as well as relative and absolute CBF changes during focal neuronal activation (13, 14). While previous applications of the CBF-based functional MR imaging techniques have focused mainly on determining baseline CBF values and CBF changes during brain activation, the aim of this study was to assess regional cerebral blood flow (rCBF) changes during repeated challenges of breath-holding of various duration. The BHT has the advantages of not requiring a source of CO2 or acetazolamide injection and therefore can be easily performed during a routine MR examination. The study included six healthy volunteers (four men and two women) with ages ranging from 27 to 33 years. All participants gave informed consent, and the protocol was approved by the Institutional Review Board of the Stanford University School of Medicine. Images were obtained using a 1.5-T scanner equipped with an “echo-speed” gradient system. The maximum achievable gradient amplitude and slew rate were 22 mT/m and 120 T/s per meter, respectively. A small, receive-only elliptical bird-cage head coil was used for all images, and subjects were stabilized with foam padding packed tightly in the coil. The FAIR spiral sequence was implemented by applying an adiabatic inversion pulse prior to the gradient-echo data acquisition. After an inversion pulse and a subsequent tagging delay, a gradient-echo image was acquired using a 15.6-millisecond spectral-spatial 900 RF pulse and single-shot spiral readout gradients. The design of the spiral readout gradients was based on the variable rate method proposed by Hardy and Cline (16) using the Ridder search algorithm to improve execution time. For this study we used a matrix size of 128 × 128 over a field of view of 240 × 240 mm2, which corresponds to a one-shot spiral readout window of 65 milliseconds using a 100-kHz receiver bandwidth. For each volunteer, three sections with a thickness of 8 mm and intersection spacing of 2 mm were imaged. The first section had an inversion time (TI) of 1200, whereas the TI for the other sections was successively increased by about 50 milliseconds. MR signal changes induced by functional activation encompass signal originating from both brain microvasculature and large vessels. Therefore, signal originating in the microvasculature of the cerebral gray and white matter has to be separated from signal in the macrovasculature. Using a TI of 1200 and a small bipolar gradient, which was employed prior to the spiral readout, we successfully excluded large-vessel contributions. For each FAIR sequence, two images with and without section-selective gradients during an adiabatic inversion pulse were acquired in an interleaved fashion. All parameters were kept the same, except the section-selective gradient. In this manner the magnetization transfer effects of these two inversions can be regarded as nearly identical. The slab thickness of the selective inversion pulse was increased to extend about 1 cm at each end beyond the region of the multiple sections imaged. Image reconstruction was performed off-line on a Sparc workstation (Sun Microsystems, Mountain View, CA) using the gridding algorithm described by Meyer et al (17). The images were visually inspected for motion with the use of a movie tool. The reconstruction routine also used an acquired B0 field map to correct for linear shim terms and carrier frequency offset in each section. The imaging procedure for each volunteer was as follows: 1) sagittal localizer images were obtained with a conventional gradient-echo sequence; 2) a midsagittal image was used to prescribe axial sections through the frontoparietal lobes of the brain; 3) sections above ventricles were selected to avoid possible artifacts; and 4) fast spin-echo images were acquired at the same locations to serve as anatomic images. For CBF quantification, fast T1 mapping was also performed by using a Look-locher technique combined with single-shot spiral imaging. The entire inversion recovery curve was recorded in a single TR. A single inversion was followed by multiple low-flip-angle excitations and readouts. In each subject, two studies were carried out: FAIR images were acquired for a total dynamic scanning time of 10 minutes during alternating periods of breath-holding and self-paced breathing at 40-second intervals after inspiration and at 30-second intervals after expiration. The time to start and to stop breathing was indicated by projecting the instruction into the magnet bore in front of the subject. To exclude visual activation from the projection set-up, the level of brightness was the same during the periods of breath-holding and of self-paced breathing, and all subjects were instructed to keep their eyes open and to maintain constant attention during the experimental procedure. To quantify the relative signal changes, 2.5-minute baseline samples were acquired during normal breathing. After excluding the baseline images, 150 time frames suitable for signal change analysis were collected for each sequence. From the alternating selective and nonselective images, 75 frames of FAIR images were calculated by magnitude subtraction of the nonselective inverted image from the selective inverted images. The consecutive FAIR images generated during the same paradigm were also used for functional map calculations. The block trial data were analyzed using cross-correlation with a boxcar reference waveform with amplitudes of 1 for the stimulation phases (shifted by 6 seconds to account for the hemodynamic latencies and rise times) and 0 for baseline and control periods (18). A minimal cluster size of 5 pixels was adopted to diminish the occurrence of apparently significant single pixels. Activated pixels were identified from the cohort of surviving pixels having correlation coefficients exceeding 0.41 (P < .01), and the resulting maps were overlaid on the T1-weighted images. Neither temporal nor spatial filters were applied. Signal intensity time courses were derived as the mean of all pixels admitted by the analysis. The data were not corrected for baseline drifts. Time-locked averaging was then employed to calculate the breath-holding–induced FAIR signal changes from the mean time signal courses (19, 20). where SFAIR is the signal intensity of the subtraction FAIR image, ƒ is the CBF (mL/100 g per minute), λ is the tissue-to-blood partition coefficient (0.9 mL/g) (21), and M0 is the fully relaxed magnetization of tissue-water proton (13). Repeated challenges of breath-holding for 40 seconds after inspiration and for 30 seconds after expiration induced an overall rise in rCBF. Figure 1 shows the topographical pattern of the breath-holding effect in a typical subject for the two different breath-holding paradigms. In general, blood flow–related signal changes during breath-holding were greatest in gray matter and insignificant in white matter. While the number of pixels admitted by analysis did not differ significantly between the two breath-holding paradigms (P = .7), areas with significantly increased CBF during these two respiratory challenges were not completely congruent. FAIR maps of blood flow–related signal changes for a typical subject during repeated challenges of breath-holding for 40 seconds after inspiration (top) and for 30 seconds after expiration (bottom). The maps were generated by cross-correlation analysis with a boxcar reference waveform (correlation coefficients exceeding 0.41; P < .01) and a minimal cluster size of 5 pixels superimposed onto T1-weighted images. Areas of significant CBF-related signal changes during breath-holding are found mainly in gray matter. The corresponding time course of the mean rCBF changes is presented in Figure 2. 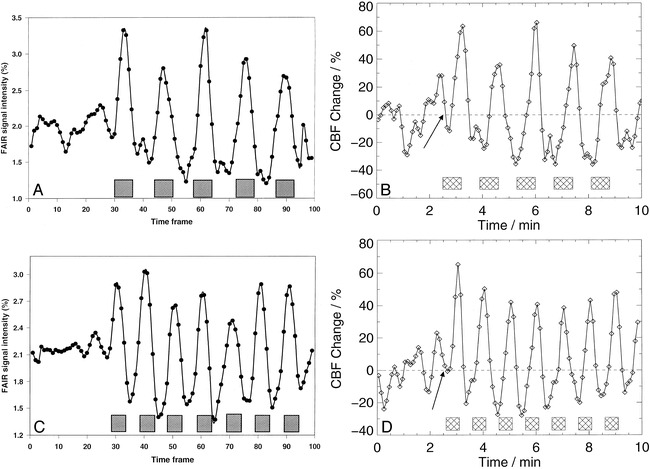 Breath-holding after expiration yielded an immediate rCBF increase (Fig 2D), whereas rCBF declined initially during breath-holding after inspiration (Fig 2B). Owing to transient periods of hyperventilation, blood flow–related signal changes typically went below baseline after breathing resumed. Using the mean baseline rCBF values of areas with significantly increased CBF during breath-holding as a reference to calculate the rCBF changes, quantitative analysis yielded an rCBF increase of 47% to 87% after breath-holding. The Table summarizes the mean baseline rCBF values (mL/100 g per minute) and the mean percentage of rCBF changes of all sections for repeated challenges of breath-holding for each volunteer. Baseline rCBF values of all pixels admitted by analysis varied from 59 to 85 mL/100 g per minute (73 ± 13 mL/100 g per minute). The rCBF changes clearly depended on the breath-holding duration and technique; however, for one given breath-holding paradigm, the results showed relatively small interindividual variability. Despite a 10-second shorter observation period, the results of the 30-second and 40-second groups were comparable owing to the initial decrease of CBF during breath-holding for 40 seconds after inhalation. With the advent of functional MR imaging, it has become possible to visualize human brain function noninvasively. Because of its high spatial and temporal resolution, these techniques are also increasingly used to study cerebral hemodynamics and cerebrovascular reserve (1–3), complementing the arsenal of functional brain investigations feasible with MR imaging. While previous applications of the CBF-based functional MR imaging techniques have focused mainly on determining baseline CBF values and CBF changes during brain activation (13–15), in the present study we assessed rCBF changes during repeated challenges of breath-holding of various duration. The absolute baseline rCBF values in cortical gray matter regions with significantly increased blood flow during breath-holding, 73 ± 13 mL/100 g per minute (range, 59 to 85 mL/100 g per minute), measured with the FAIR technique in this study agree well with those reported by Kim and colleagues (13, 14): in gray matter areas within the motor cortex, 71 ± 15 mL/100 g per minute (n = 6); and in gray matter areas within the visual cortex, 75 ± 18 mL/100 g per minute (n = 12). Moreover, these values are comparable to global gray matter CBF values measured by positron emission tomography (PET): 72 ± 9 mL/100 g per minute (n = 130) (22). During breath-holding, the increase in PaCO2 gives rise to increased CBF because of vasomotor reactivity. Numerous studies in humans and animals involving the use of many different techniques have shown consistent results of cerebral vasodilatation to hypercapnia and vasoconstriction to hypocapnia (23–25). In good accordance with previous MR studies (6–8, 26), areas that showed an increase in rCBF during breath-holding were predominantly in the gray matter. It remains to be elucidated whether this observation reflects regional variations in the sensitivity of the arterioles to CO2 stimulation or whether it is because the FAIR technique has a different sensitivity to changes in tissue perfusion in different regions. Similar to our recent BOLD and FAIR data (26, 27), the time course and the magnitude of the increase in CBF clearly depended on the breath-holding technique. Breath-holding after expiration leads to an instantaneous increase in PaCO2 (28). In breath-holding after inspiration, however, PaCO2 shows a biphasic change; it is reduced at the onset, followed by a marked increase with an accompanying decrease of arterial pH. Therefore, breath-holding after expiration will lead to a rapid increase in CBF, allowing shorter breath-holding observation periods. Despite a 10-second shorter observation period, 30-second breath-holding after expiration yielded results comparable to those obtained with 40-second breath-holding after inspiration. Since functional MR imaging is still in its infancy, some precautions should be exercised when interpreting the present data. In contrast to recent BOLD functional MR imaging studies (6, 7, 26), regions of significant rCBF changes during breath-holding were unevenly distributed throughout the cortex in this study. However, detection of the entire area with increased rCBF during breath-holding may be hampered by a decreased signal-to-noise ratio.The uneven distribution of regions with significant rCBF changes during breath-holding may also be attributable in part to differences in CO2 reactivity among various brain regions (29). Future studies will have to clarify these discrepancies between areas of BOLD- and FAIR-related signal changes during breath-holding maneuvers. Additionally, comparative studies of PET, single-photon emission CT, transcranial Doppler sonography, and functional MR imaging appear warranted. The physiologic response of vasomotor tone to vasodilatory stress from either functional activation or pharmacologic manipulation is one of the prime features of intact cerebral perfusion. CBF in healthy persons ensures that a fall in perfusion pressure is counterbalanced by vasodilatation of cerebral arteries, which, under normal conditions, maintain adequate CBF. This cerebrovascular reserve can be estimated by measuring the response to a vasodilatory stimulus. The response of cerebral perfusion to vasodilatory stress is not merely of scientific interest but also of potential clinical interest for patients with hemodynamically relevant atherosclerotic disease (30, 31). Recent studies have documented a significantly increased risk of stroke or transient ischemic attack ipsilateral to a stenosis or occluded internal carotid artery in patients with impaired CVR (32). Assessment of CVR is thus recognized as an important parameter in the management of cerebrovascular diseases, and a less invasive and more readily available method to investigate CVR would be useful for clinical application. 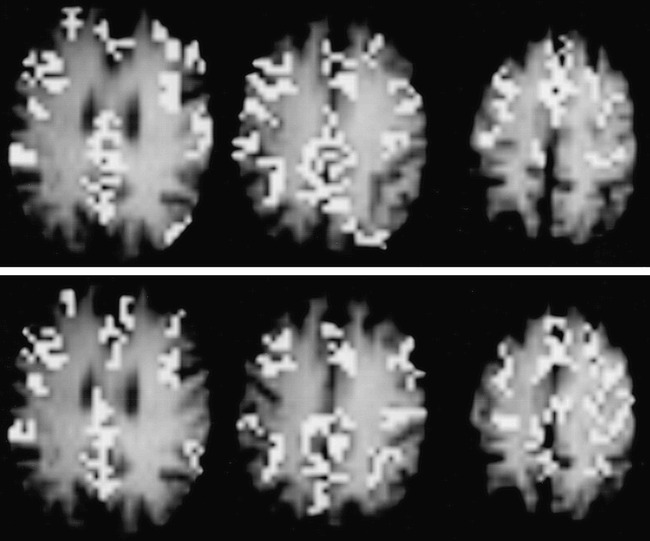 While PET is considered the standard of reference for assessing cerebral perfusion because of its potential to quantify CBF, CBV, and fractional oxygen extraction separately, functional MR imaging is noninvasive, does not involve exposure to radiation, and therefore has the advantage of repeatability. Recently, we found that regional cerebral blood oxygenation changes during breath-holding could be detected by means of functional MR imaging at 1.5 T (26). The BHT has the advantage of not requiring a source of CO2 and acetazolamide and therefore can be performed easily during a routine MR examination. Potential shortcomings of this method should be noted. The BHT may be limited for quantitative purposes. Since PaCO2 may rise at different rates during breath-holding in different subjects, estimation of the PaCO2 are not possible. Moreover, its use may be limited in patients who have an impaired respiratory function. The present study illustrates that the FAIR technique is capable of mapping hemodynamic responses to apnea, thus making it possible to determine absolute rCBF changes during a respiratory challenge. Since FAIR imaging requires subtraction of selectively and nonselectively inverted images, the temporal resolution of FAIR data is reduced by a factor of two, compared with that of T2*-weighted imaging. Consequently, compared with the BOLD technique, the FAIR technique can provide quantitative CBF data at the price of a decreased SNR and temporal resolution. In terms of SNR, the FAIR technique could profit from higher field strengths. In contrast to the FAIR technique, it is even possible to detect BOLD signal intensity changes as short as 18 seconds during repeated challenges of breath-holding (26). Yet, for quantitative and clinical purposes, the BOLD method may be limited because of its dependence on multiple parameters, such as CBF, CBV, and CMRO2. The minimum time required to generate detectable blood flow–related signal changes during breath-holding is a subject for further study and would have an impact on the applicability to future patient studies. The FAIR technique can be used to determine absolute rCBF values at steady-state conditions as well as relative and absolute rCBF changes during a vascular challenge. In the present study, the FAIR technique was successfully used to map and quantify rCBF changes during breath-holding. Although the absolute baseline rCBF values of all cortical regions with significantly increased blood flow–related signal changes during breath-holding are comparable to previously obtained PET data in other cortical areas, further validation of the CBF values obtained with the FAIR technique is required. In the future, mapping and quantification of CBF-related signal changes during respiratory challenges may be exploited to study global hemodynamic changes and CVR in research studies and, potentially, in the clinical setting. This study was supported by a research grant from Deutsche Forschungsgemeinschaft (Ka 1419/1-1). T-Q Li was supported by NIH NCRR P-41 09784. We thank the volunteers for their participation in the study. We are greatly indebted to Dr. H. E. D'Arceuil for reviewing this manuscript. ↵1 Supported by a research grant from the Deutsche Forschungsgemeinschaft (Ka 1419/1-1). Dr. Li was supported by NIH NCRR P-41 09784. ↵2 Address reprint requests to Andreas Kastrup, MD. Accepted after revision February 22, 1999.